ACES The sushi rolls at Boathouse are decidely Americanized, but that doesn’t mean they aren’t good. Graton Resort & Casino positions itself as an all-inclusive destination. As such, it offers a wide variety of amenities and services. There's a hotel, boutiques and even a hair salon. When gamblers get hungry, they can choose from a variety of restaurants that ring the casino. Joining the likes of a pizza parlor and a steakhouse is the Asian Boathouse Eatery, a mix of Japanese and Chinese cuisines that features sushi rolls, ramen and wok-fried dishes. Sometimes this type of pan-Asian hodgepodge can fall flat, but not here. 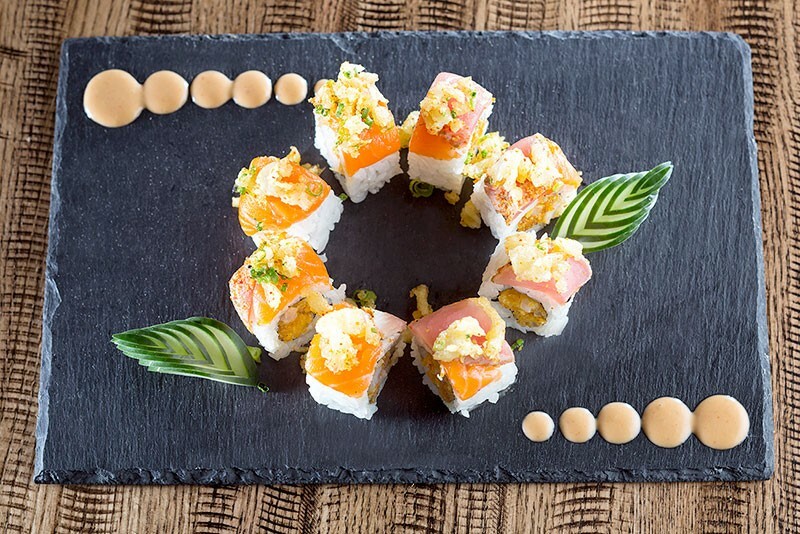 The restaurant is the work of the team behind Rohnert Park's Boathouse Sushi, a beloved destination now closed to make room for this glitzy new endeavor. Moving to a noisy casino didn't diminish the Boathouse's flair in any way, and even injected new energy. Shying away from the casino's larger-than-life design, Asian Boathouse Eatery is neatly designed in black, white and deep reds, with booths, small tables and a roomy bar. It's easy to see the gambling action, but equally easy to forget where you are, thanks to the soothing atmosphere and reserved, professional service. The menu includes sushi and sashimi, as well as salads, soups and noodle bowls. The rolls are large, Americanized specimens that deliver unapologetically bold and rich flavors. Both the Lahaina roll ($17), featuring soft shell crab, shrimp tempura, seared ahi and spicy sesame ponzu on top, and the Dragon roll ($16), with shrimp tempura, crab, barbecued eel, avocado and unagi sauce, have a good balance of flavors in spite of their abundance. If you're looking for something more stripped-down, check out the changing list of sashimi. The appetizers are bigger and bolder than described on the menu. Dungeness crab, flavored with a hint of mayo and cream cheese, makes an appearance in the crispy wontons ($10). The big, twisted parcels of dough come alongside a fiery red "sweet and sour plum" sauce that resembles an upscale Sriracha. The veggie potstickers ($9) and the green papaya salad ($12) provide more restraint, and the cabbage-stuffed potstickers are satisfying and light. Sometimes the classic Southeast Asian salad dish comes drenched in puddles of lime and fish sauce, but at the Boathouse, it's pleasantly mild, perfectly crunchy and flavored with fresh basil. From the list of entrées, the clams in black bean sauce ($19) and chicken lo-mien ($14) are both homey, comforting dishes. The Manila clams could have been larger and meatier, but the thick, ginger and garlic-spiked bean sauce provides depth and substance. The modest-looking lo-mien, noodles, stewed onions and chicken, is irresistible. Minding the gambling puns, Asian Boathouse Eatery is a safe bet for a stylish night out, fit for a hungry crew with diverse tastes. Executing such a wide variety of dishes well is not an easy task, but Boathouse plays with a winning hand. Asian Boathouse Eatery, 288 Golf Course Drive West, Rohnert Park. 707.588.9440.